See Las Vegas like a star on this popular club crawl experience. 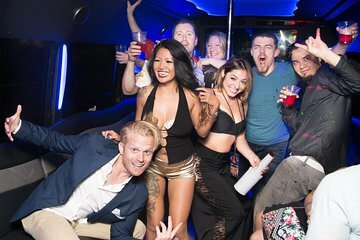 Gain VIP access to three of the city's hottest clubs and travel by party bus through the streets of Sin City. You'll get professional photos, strong drinks and more with this day or evening clubbing experience. First bad point, no ice breaker with the group, no presentation, we went straight away in the first nightclub Hakasan in MGM Grand after 30 minutes of wait in the lobby... we didn't spend any time with the group in the nightclub, we were just by ourselves so it was not really fun. Finally, we arrived at the Intrigue Wynn, the second club was better but like the first one without the rest of the group. The only good point was the wristband which allows us to enter the nightclubs without waiting !!! The tour was amazing and our tour guide Amanda was the best.